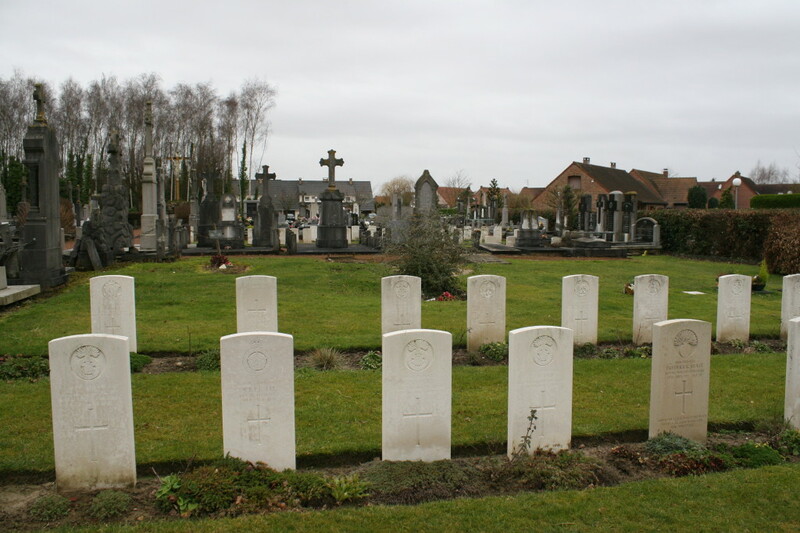 The communal cemetery in Bois-Grenier contains 121 British Great War burials. 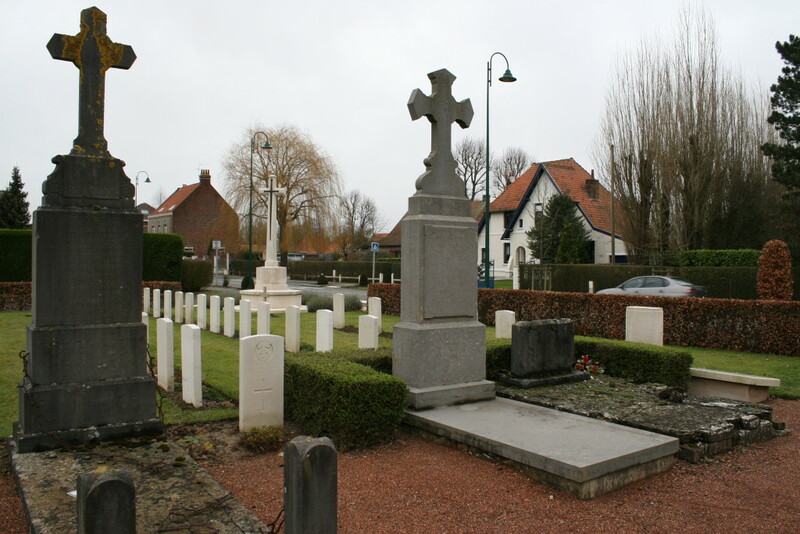 Cemetery entrance, with the Cross of Sacrifice visible to the far right. 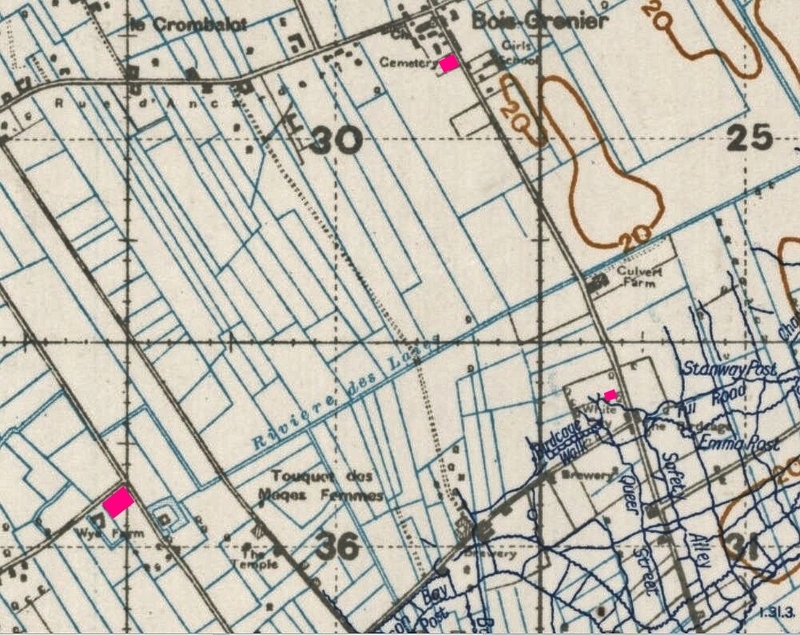 Before we go any further, this extract from a 1917 trench map (not much would have changed since 1915) shows the two cemeteries that we have already visited on this tour, Y Farm Military Cemetery (the origin of its name becomes obvious) to the bottom left, and the much smaller White City Cemetery towards the bottom right, where the British trench system begins. Our current location is marked at the top of the map. 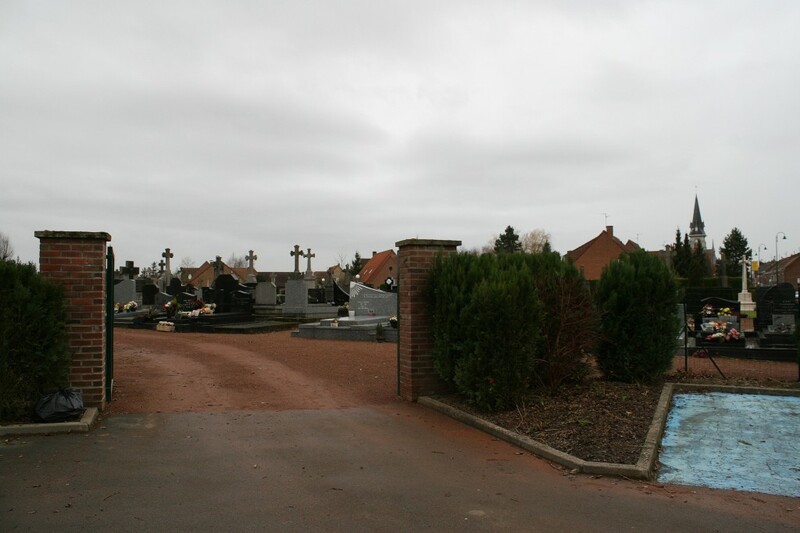 The British burials are to be found in different areas of the cemetery, by far the largest section being in the northern corner (above & below) where the Cross is sited. 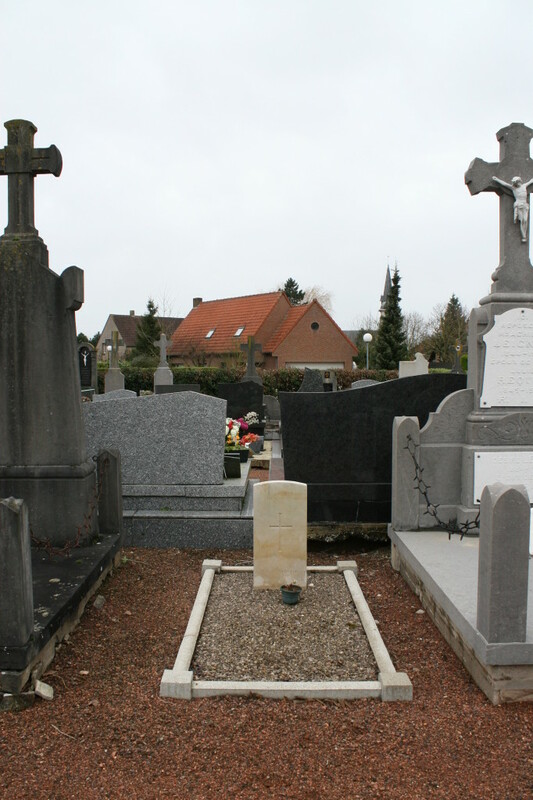 Note the housing for the cemetery register in the foreground. 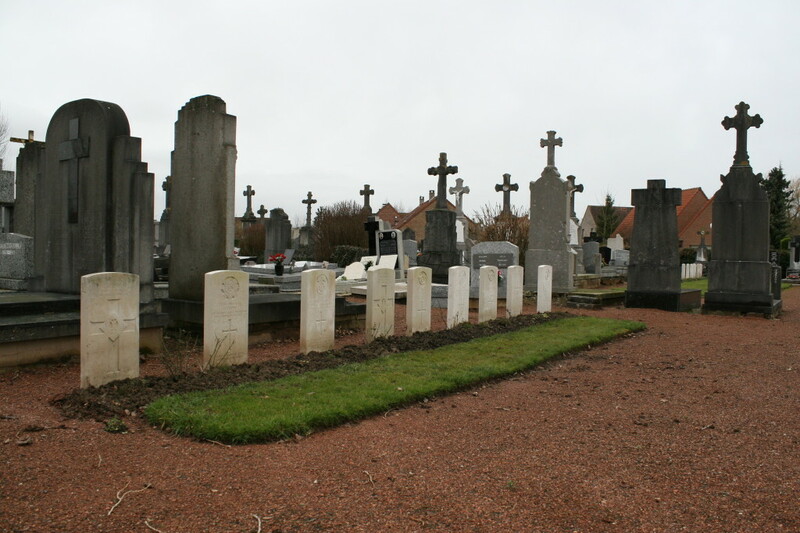 Four unidentified French World War I burials are to be found among the British graves here, all four visible, or at least partly visible, in the photo above. …and Rows D to F (above furthest left). Stitch the two previous photos together, and this is what you get. 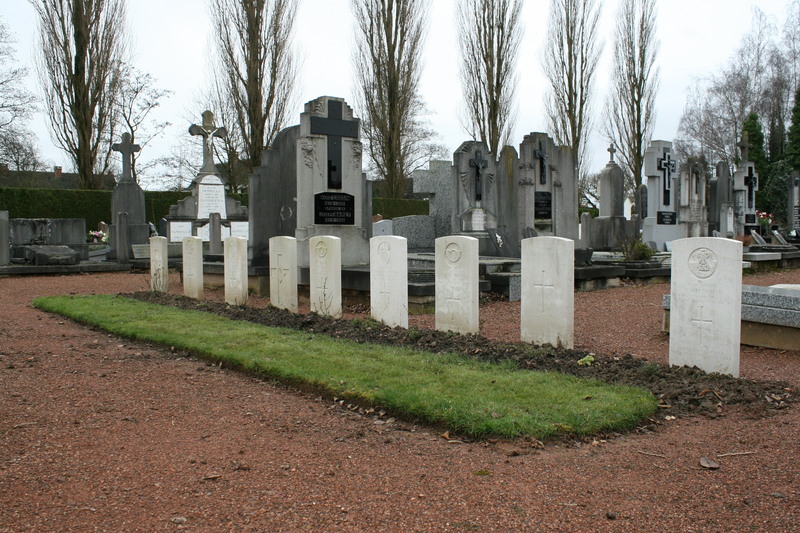 The three headstones facing the camera in the foreground, all Royal Welsh Fusiliers, comprise Row M*. 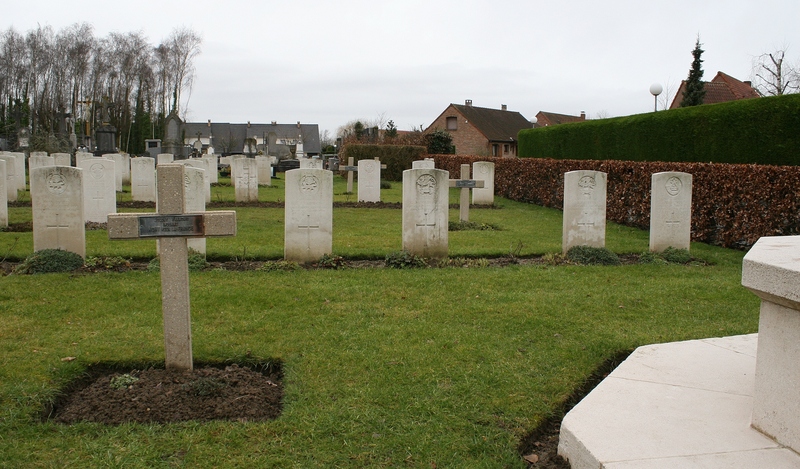 Behind this Frenchman, and just visible in the left background of the previous shot, an unknown British soldier, one of only eight in the cemetery, lies next to an officer of the Welsh Fusiliers (see below) in Row G.
Looking in a westerly direction across the headstones of Rows E & F. It’s interesting to compare the differences between the three Royal Welsh Fusiliers headstones from the left in the front row with the one on the far right; not just the spelling, but also the regimental emblem. 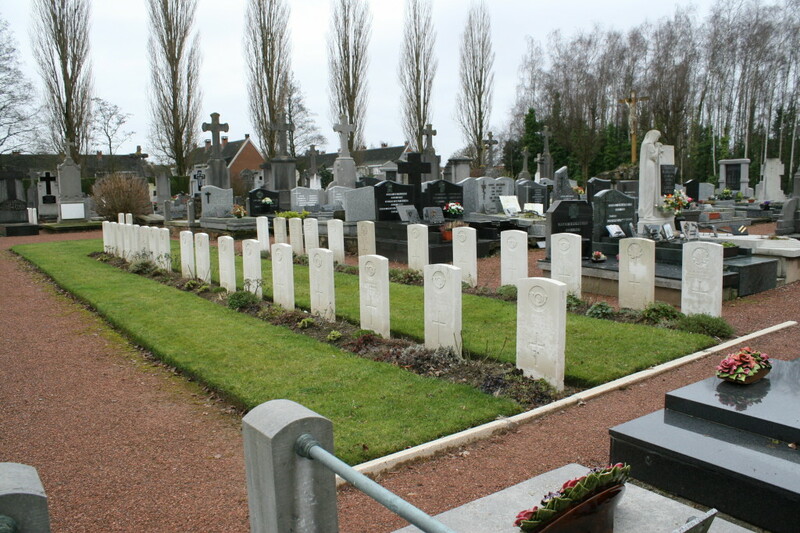 The Welsh Fusiliers used this cemetery between January and July 1915, burying 36 of their men here during that time, more than any other regiment. 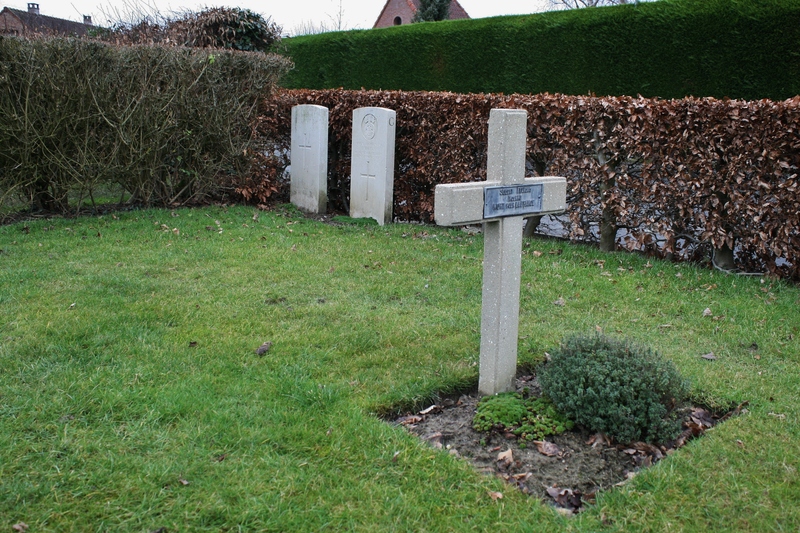 In the background you can see some of the other British graves we have yet to visit. As we head towards them, this view looks back at the section we have just seen, Row F now nearest the camera on the right. Time to have a look at the cemetery plan, methinks. 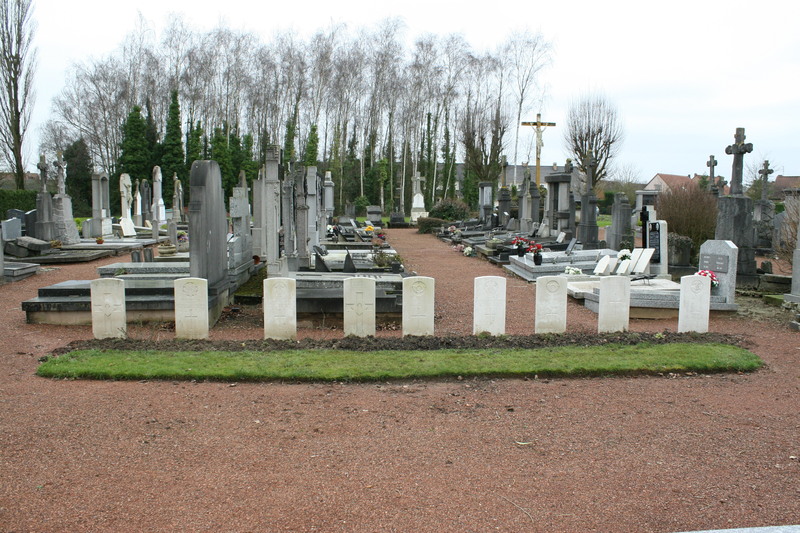 As you can see, Row H (above & below) is some distance from the graves we have already visited. 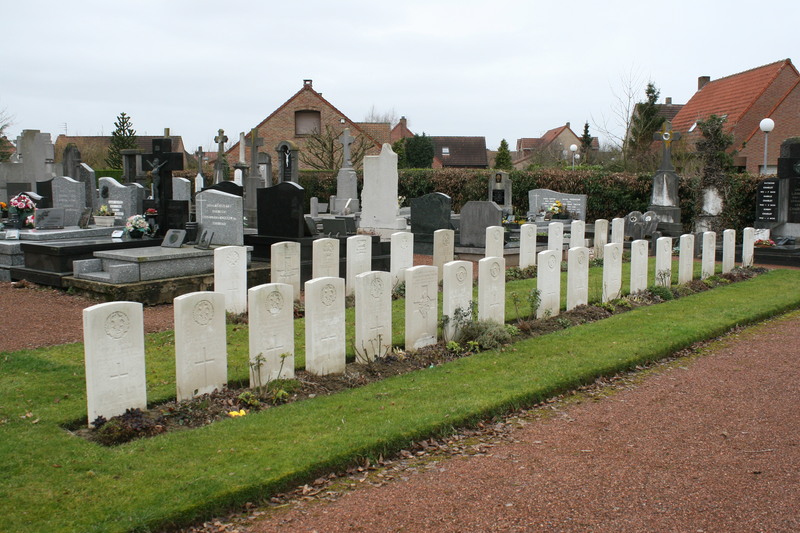 These men of the King’s Own Yorkshire Light Infantry all lost their lives towards the end of May 1915. 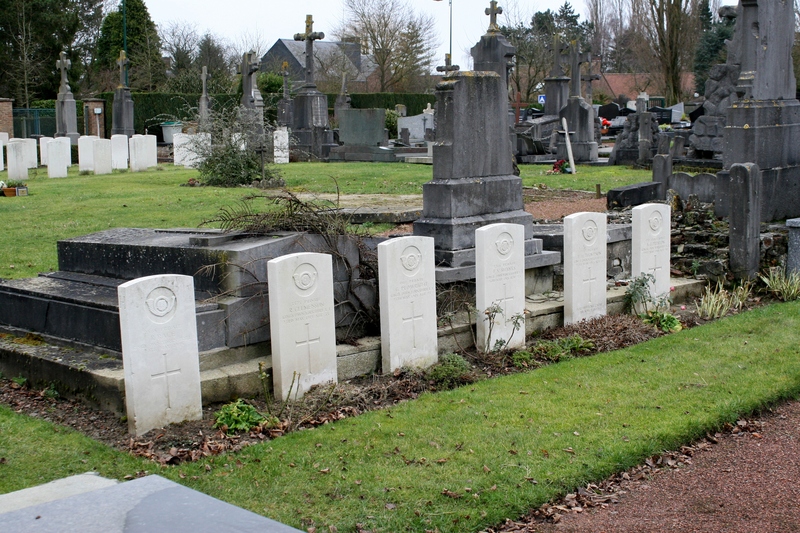 Above & below: A little further into the cemetery (Row H is still visible in the right background) we find Rows J (foreground), I (right) & K (left). 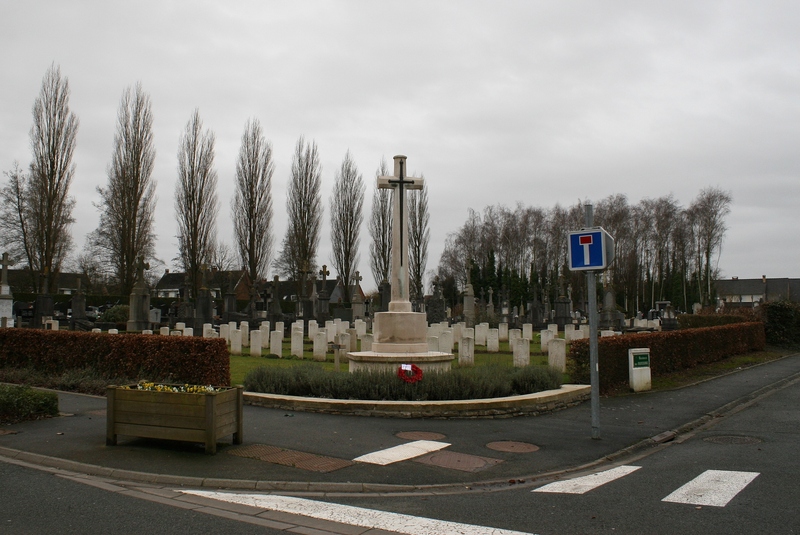 The earliest burials here were made in October 1914 and the cemetery was used on a regular basis until mid-July 1915, by which time Brewery Orchard Cemetery, just north of the village, had taken over as the main British cemetery in Bois-Grenier. 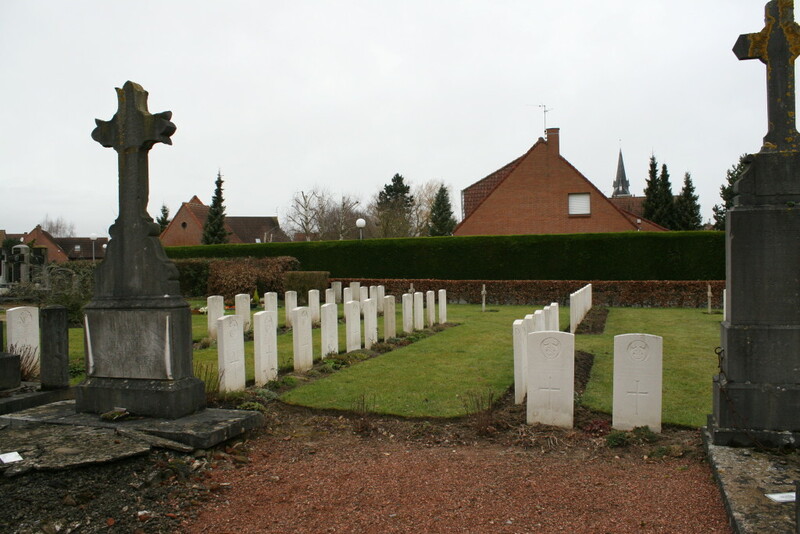 A further half dozen burials were made here in the communal cemetery after July 1915, all but one later that same year. 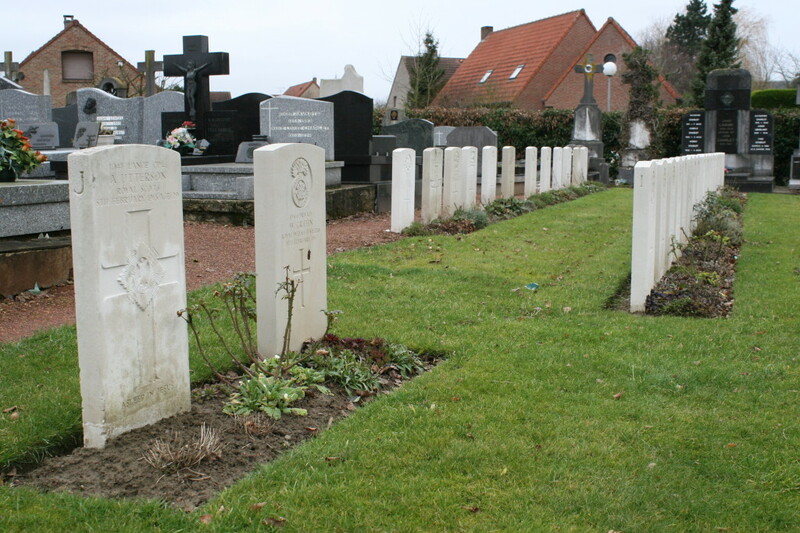 The exception, Private E. Morris, died in July 1919, his headstone, at the beginning of Row K, being the third one from the left in the picture above – the ‘whitest’ headstone in the shot. 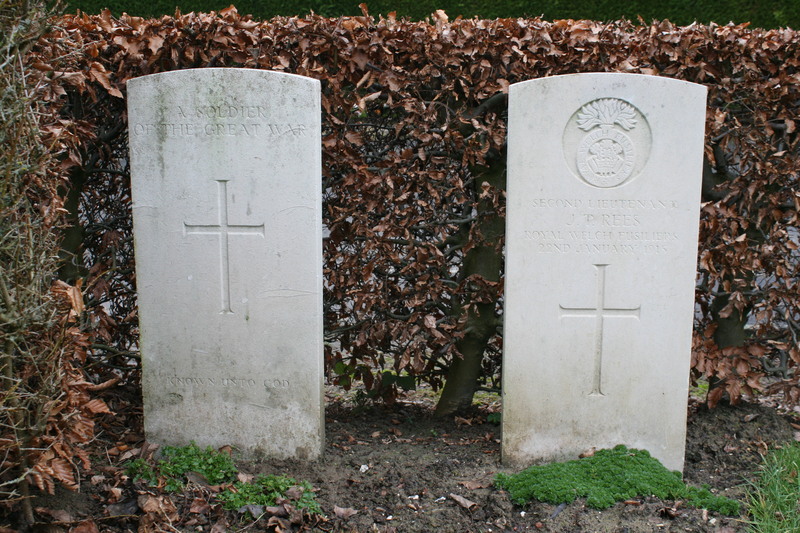 It is possible that he was initially buried elsewhere and then moved here later – the CWGC website tells us that three men in Row K were moved here, but doesn’t identify them – but, although his headstone bears the regimental emblem of the Sherwood Foresters (Notts and Derby Regiment), his papers state that at some point he was transferred to the 65th Prisoner of War Company, Labour Corps, in charge of German prisoners, quite likely engaged in battlefield clearance. 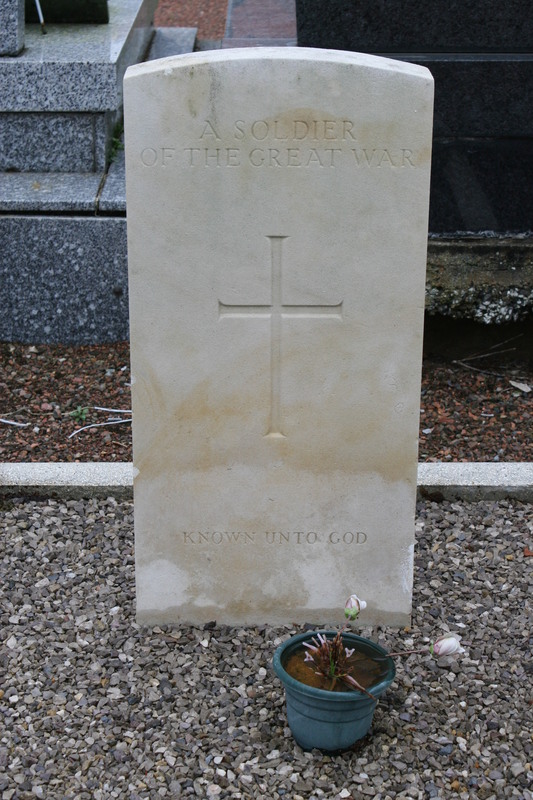 Did Private Morris die whilst engaged in the many months of this difficult task that followed the Armistice, or was he perhaps another victim of the dreaded flu pandemic that swept the globe in 1919? …and at the other end of Rows I & K, more men of the KOYLI, who buried 26 of their dead here in May and June 1915. We shall visit Row L, just visible in the far left background, shortly. Beforehand, tucked between these huge civilian graves, the final resting place of a solitary unknown British soldier. So sad. 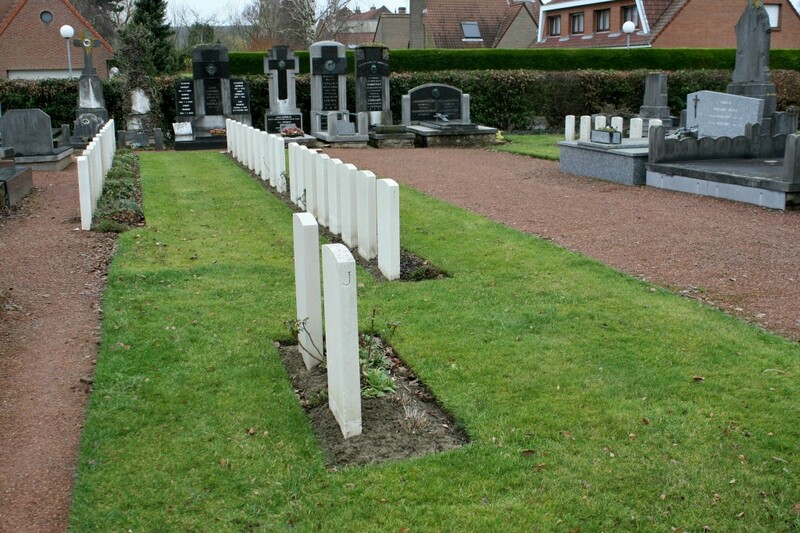 Row L (above & following two photos), as you can see from the cemetery plan, stands alone on the southern side of the cemetery. …side by side in a foreign field. 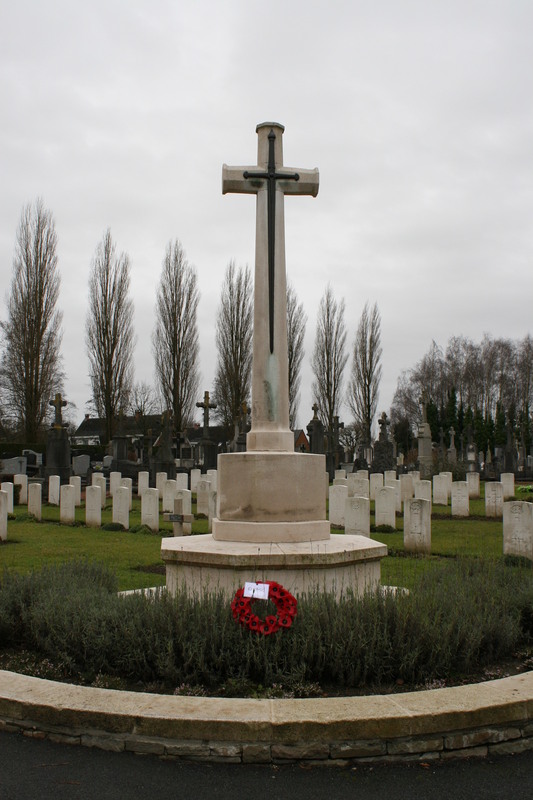 A CWGC wreath beneath the Cross of Sacrifice sees us on our way to our next stop. 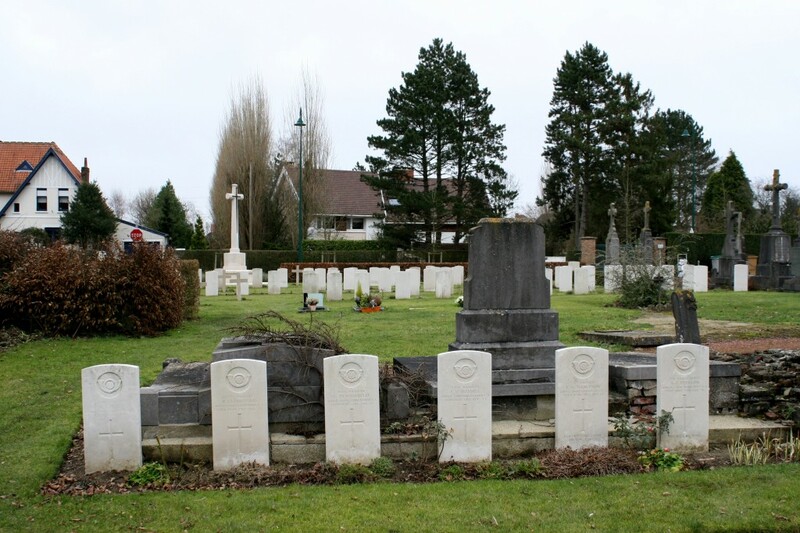 I find it slightly curious that these graves weren’t concentrated into a proper CWGC (or IWGC as it was at the time) cemetery. Seems rather odd to leave them mixed in with all the local graves, particularly when there are two larger cemeteries nearby. Perhaps they just decided that 121 was too many to move. I agree. At the least you would think that all the graves might have been concentrated in the largest plot here. But, despite the lone unknown man, I’m rather glad they left well alone. Bois Grenier get a mention in our next post, btw.